There are certain countries in the world where it’s illegal for a single person to have more than one job, which is why there are a lot of companies that require a particular document to ensure that an applicant doesn’t have one. You may also see resignation letter examples. The document acts as a security measure because if the applicant is not able to provide it, then the company may turn the application down and prevent having someone that already has a job; thereby also preventing the company from breaking the laws of the country. This kind of document is what one would call an employee or job relieving letter and this article will teach you all that you need to know. You may also see new job resignation letters. What is an Employee Relieving Letter? 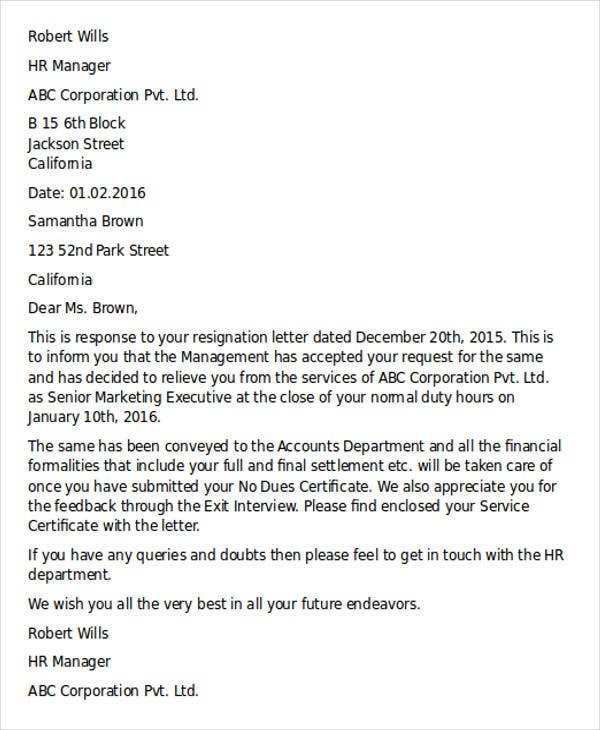 A relieving letter is a document that is issued by a company in the event that a particular employee wishes to leave. In a way, it’s similar to a termination letter which basically states that the employee is relieved from his/her duties and that the employee has officially ended the employment. 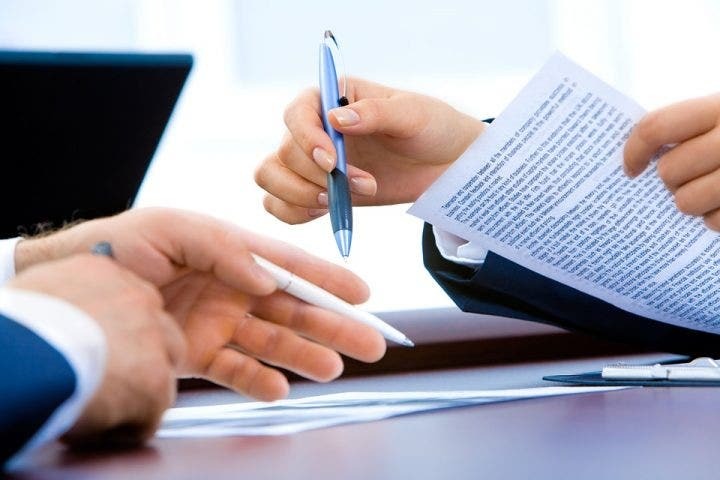 You must remember that this letter will be required by other companies that wish to hire the resigning employee because they will definitely need to verify pieces of important information such as the job title that the employee previously held and the date on which the letter was made. 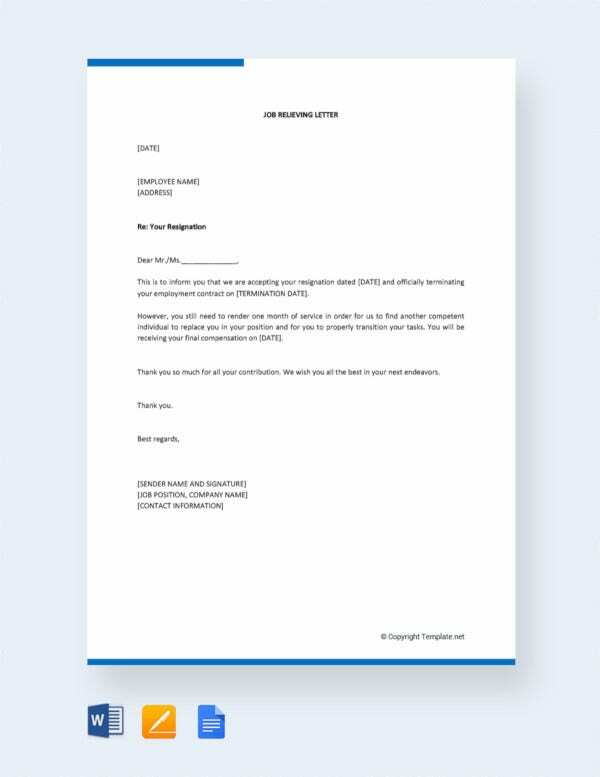 If you’re the employee who wishes to leave a company, then you’ll definitely need to request this letter so that you can finally resign without having to worry about your employment status. When are You Supposed to Get the Relieving Letter? 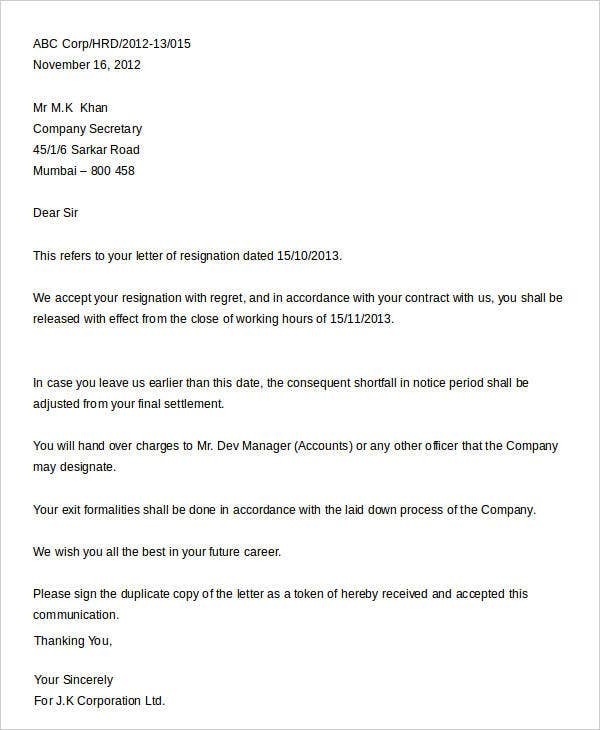 The relieving letter should be issued on the same day that you are going to leave the company. 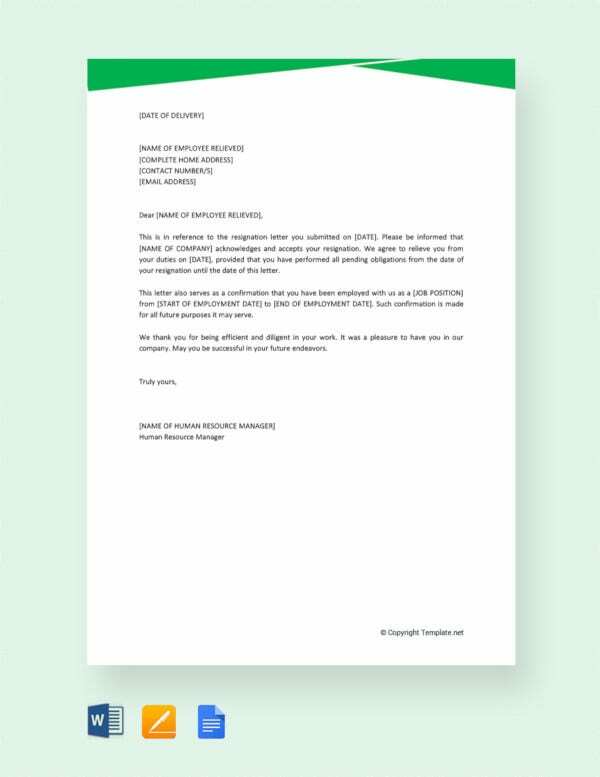 In the event that you have not received this letter, then that can only mean that the company has not accepted your resignation. You will still remain as an employee of the company if you are yet to receive the relieving letter. So if you’re wondering as to why you still haven’t acquired one, then you may always ask those in Human Resources for the specific reason so that you can clear things up as soon as possible. Why Have I Not Received My Relieving Letter? If you’re wondering as to why you are yet to receive your sample letter, then there can be multiple reasons. However, the one thing that all of these reasons have in common is that they are all related to the company that you work for. There’s a very good chance that the reason as to why you have not received the document is because there is still unfinished business between you and the company. For example? Let’s say that you are currently in-debt with the company as you have made too many advances regarding your pay. It should be very obvious that the company won’t just let you go until you’ve managed to pay off your debt entirely, meaning that you won’t acquire the relieving letter until you’ve settled it completely. Another is that the employment contract you’ve signed may have stated that you are not allowed to quit until after a certain number of months have passed; meaning that you’ll need to stay and work for the company until you’re legally allowed to quit and obtain that relieving letter. So unless you want to face the consequences, you’ll have to finish whatever unfished business you have with the company before you finally get the letter you want. What is a Relieving Letter Used For? While the entire point of acquiring this letter is for the sole reason of ensuring that you have finally concluded your relationship with the company that you previously worked for, there’s also another important reason as to why you’re going to need this. This involves you trying to acquire another job. You may also see examples of resignation letters. You have to remember that there are certain countries in the world wherein one person is not allowed to have more than one job. This will mean that all the companies that are in those countries are going to require evidence from every applicant so that they can make sure that these people are not currently employed with another company. Also, it’s a very helpful tool for verifying all the information regarding an employee that has just left his/her previous company. You may also see email resignation letters. You’ll never know if a person is lying in regards to his/her credentials so the letter can definitely help in verifying whatever information one has provided. How to Create a Relieving Letter? Now that you’ve learned all that you need to know regarding a relieving letter, the next step that you’ll need to take is to actually create one. Know that the only time wherein you’ll have to create this type of letter is in the event that an employee within your company wishes to leave and has proven that he/she is qualified to do so. 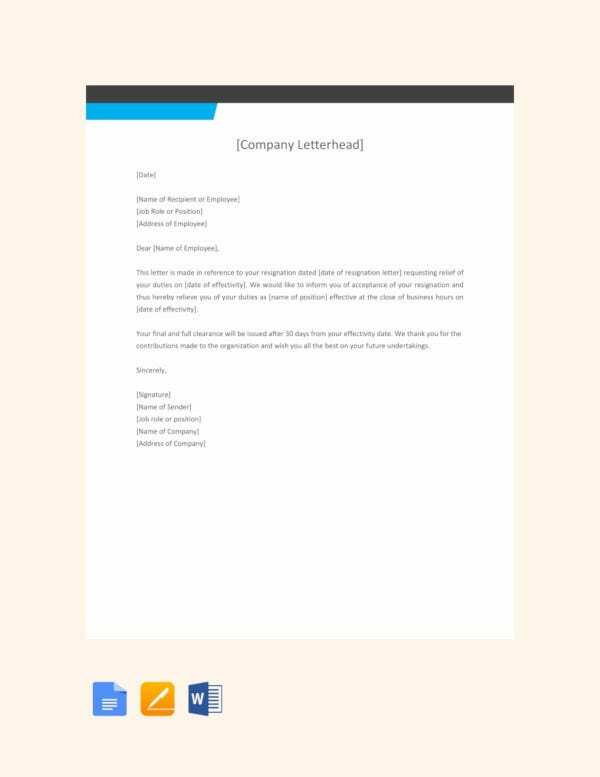 This means that before you go about in creating this letter, you’ll first need to verify whether you have concluded all manners of business with the employee that wishes to resign. If there are no problems in terms of whether the employee has earned the right to receive the letter, then you can go about in creating it. You may also see corporate resignation letters. A letter that holds this much importance will require that you place down all the basic personal information of the employee who is about to leave your company. The other employers that are going to go through this letter will want to find out the name of the person that’s applying for a job in their company, as well as other important pieces of information that they’re going to have to verify. This means that you’ll need to provide them with the complete name of the employee that has resigned from your company as well as his/her previous position. You may also see resignation letters. As you’re writing down the name of the employee, you’ll need to make sure that you write everything down completely; meaning that you’ll need to write down the first name, last name, and middle initial. Also, the reason as to why you’ll need to write down the employee’s previous job title is because other employers will have to do a background check wherein they need to check what the employee did in his/her previous company among other pieces of information; so be sure that you don’t leave this out as even you’ll want this piece of information for when you have to hire new applicants for your company. If a person is applying for another job at a different company, then that company would obviously want to learn all about the company that the person has previously worked for. 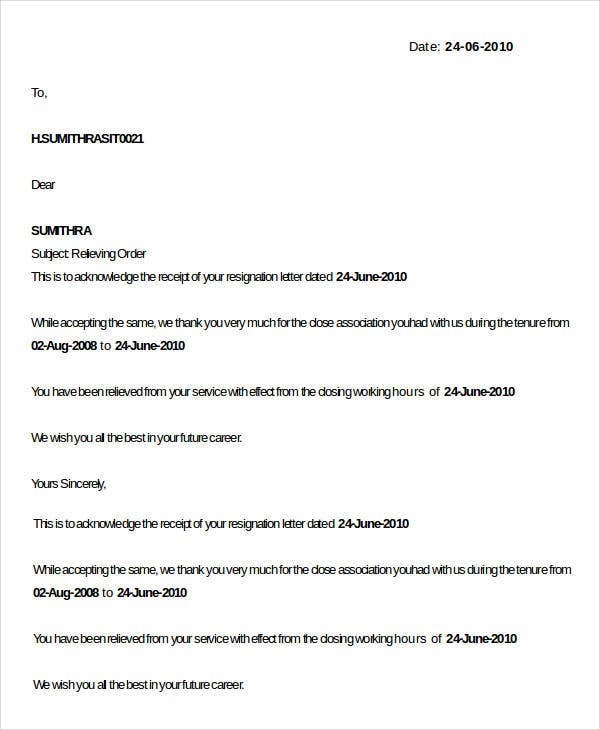 The reason for this is because they need to verify as to whether or not the company actually exists, if the company actually did issue the relieving letter, and to verify other pieces of information regarding the person that wishes to apply for them. This means that you’re going to have to write down information such as the complete name of your company, its complete address, and its contact details (this being both the phone number and email address). Also, remember that you’re going to have to write down the date on which the letter was made as the other companies will also need to verify that. If you were to go through the entire hiring process with a particular applicant, then even you would want to know important details regarding the applicant’s resignation date from his/her previous company. This isn’t just for the sake of formality as you’ll need all the information you’ll need that will tell you that the applicant is not currently employed. Because if you don’t, then you’ll be facing a ton of consequences that could result in losses for your company. You may also see sample immediate resignation letters. So to prevent that from happening, the relieving letter will need to have the date on which an employee requested his/her resignation from the company, as well as the date on which the company has accepted the resignation. So when you’re writing down these dates, you’re going to have to write them down completely, meaning that the letter should have the month, day, and year as to when the employee wished to resign and the date on which he/she officially resigned. You want to make it absolutely clear as to when the employee was finally let go as companies in which the resigning employee wishes to apply for will need it. You may also see notice of resignation letters. Whether the employee has worked for your company for a good number of years or has barely spent a month, you’ll still have to provide a statement where you thank him/her for providing you and your company with work. Even if the employee doesn’t exactly deserve thanks, you’ll still need to do this for formality’s sake as you want to show other companies that yours is one that can show gratitude to any employee that has worked for you. However, you must remember to keep an air of professionalism when writing down your appreciation of whatever the employee has provided you and your company as this is still a business letter. This will mean that you’ll need to keep the tone of the message as formal as possible. So something like “We appreciate all that you have done for the company and we wish you the best in all of your future endeavors” or anything similar to that will be just fine. You may also see professional resignation letters. If you’re the person who’s in charge of handling the creation and sending out of relieving letters, then you should know just how important it is that you write down the complete details regarding who’s issuing the relieving letter. The reason as to why it’s needed is because other companies might just want to talk to the person who was in charge of creating and delivering the letter to the applicant that wishes to apply for them. This will mean that you’ll need to write down both your name and job title. You may also see short resignation letters. Remember that you’ll need to write down your complete name into the letter as the people that wish to hire the applicant will want to talk straight to their previous employer. And lastly, you’ll have to provide your signature into the document. The reason as to why you have to do this is because your signature is basically what confirms that the letter came from you and it’s proof that you have approved the employee’s resignation from your company. Remember that there may come a time where you’ll need to create this type of letter or that you’ll need to receive one. So to make sure that you’re able to write down everything that it needs or if you want to verify that it has all the information one needs to apply for a job, then be sure to go through the steps above to help you out with that. In the event that you would like to learn more about this particular topic or if you would like to learn about anything else that’s similar, then all you have to do is go through our site, find the information that can help you, and utilize what you’ve been able to gather. You may also see formal resignation letters.